Our clients have so many reasons to keep them coming back! Find us in two locations: the trendy West Queen West Strip and the vibrant College Street West area. We maintain the integrity of your services by sourcing carefully curated products, hiring and training qualified professionals and keeping the environment strictly sterile. Bridging the worlds of high end spas and beauty on a budget is what we do best. We work tirelessly to try and maintain the integrity of our services while keeping our prices affordable and accessible. We want beauty to become your lifestyle! We work hard to keep you safe and give you peace of mind by maintaining a sterile space. At Sekai we work tirelessly to source the cleanest products for use in our services. Many of our retail products are all-natural and plant-based. Our wax and wax products are 98% natural, colophony & petroleum-oil free, and are vegetable oil-based. Our wax is very mild, and gentle to the most sensitive skin types. We use natural, locally-sourced products in our nail services and have a range of non-toxic and vegan polishes to choose from. Our retail products are all-natural with choices for every skin type. Ask us about ingredients to avoid in beauty products for your health and safety. We can happily say that our Customer Service is unparalleled. We take pride in giving you a warm, welcoming and friendly experience with every visit. We aim to please all of our clients with every small request. Want to let us know about your experience with us? Please take a moment to fill out our Feedback Form. At Sekai Nail and Beauty Bar, a sanitary environment is paramount. We are extremely cautious when it comes to your safety and peace of mind. Your hygiene is our number one concern, and we work hard to ensure that your time with us is spent in an impeccable facility. Below are some of the sanitization and hygiene practices you can expect to find. All metal and cleanable instruments are subject to strict sterilizing guidelines. After being washed, tools are sprayed with 70% Isopropyl alcohol and soaked in hospital-grade disinfectant before reusing. All sterilization at Sekai meets or exceeds the BodySafe requirements set by the City of Toronto. An inadequately-cleaned foot basin is a growing concern in the beauty industry. They can be the cause of cross-contamination of communicable diseases that include fungus, warts or bacterial infections such as Staph. Our unique pedicure stations are built to ensure the most sanitary experience. 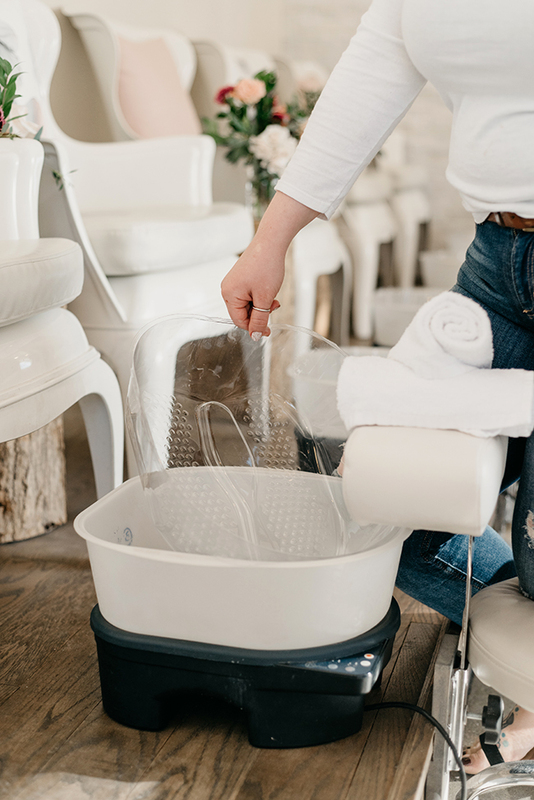 We use one-time disposable liners in our pedicure tubs, so your feet are never in the same bowl as anyone else and you can enjoy a luxurious, worry-free pedicure! We never ‘double-dip’ in our wax and discard all one time and disposable items after one use. Although we love your pets, our stringent hygiene guidelines make us unable to accommodate them – service animals are welcome! Our service and product prices subject to change without notice. We love trying to accommodate your needs but reserve right of refusal for service.